5 Tips for Running a Great Marathon! 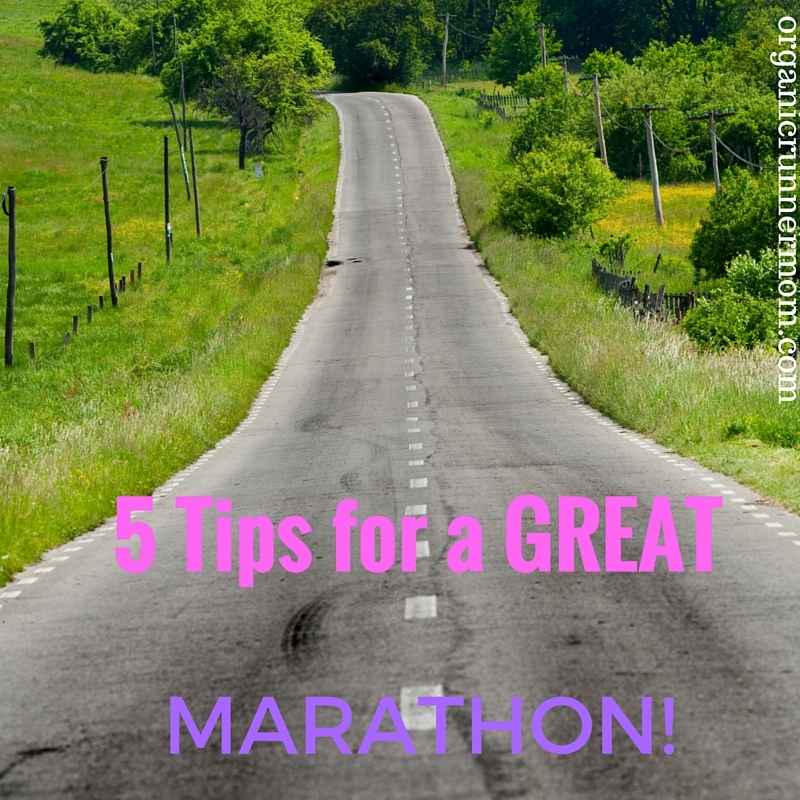 5 Tips for a GREAT MARATHON! Keeping things positive on the blog today . . . The spirit of the fall marathon is in the air and if you are a runner then you already know that this weekend is the NYC Marathon! I have never run the New York City Marathon but its definitely on my bucket list. I haven’t run a road marathon since the Boston Marathon in 2014. Now that its been awhile and since I’ve been hanging out with a lot of runners in real life and in the blog world all of this marathon talk has brought on marathon fever. I am itching to run another one and the see if I can break my PR of 3:33 and perhaps even break the 3:30 barrier. Even if that doesn’t happen the good news is that I will be 40 next fall which means that my next Boston Qualifying time will fall into the next age group. This will give me a B.Q. time cushion! Woohoo! Maybe there are some good things about being 40 after all! Ok enough with getting off course (and to those of you running the marathon make sure to run those tangents!). I told you we would be talking about tips for running a great marathon. This is obviously from my own personal experience. And believe me I’ve run the good, the bad, and the ugly (we’re talking from Boston qualifying runs to medical tent visits!). I’ve run 10 marathons including two Boston Marathons, two trail marathons and of course many different attempts to qualify for Boston and then of course my first marathon at the Nike Women’s Marathon in San Francisco (And yes I loved my first “medal” a Tiffany’s necklace!). Now listen closely because this is advice that you surely won’t want to miss . . .
How to run a great marathon. 5 tips! 1. You trained for it. TRUST your training!!!! The marathon is the prize at the end. Stay focused on how hard you worked leading up to the race and know that all of the mileage and sweat and maybe even tears along the way will get you to that finish line! 2. Run your own race. If you are planning to run with a friend and not concerned about time then no worries but if you have a goal running with someone else can be difficult mentally or can hold you back physically or push you faster than you had planned on running. Remember this is YOUR race! 3. Stick to your plan. If you are planning to run for a specific time even though the temptation is there, don’t get tricked into thinking that you can run a pace and hold on if it is something that you never trained for. This is the quickest way to crash and burn. Believe me I’ve been there and have run paces that I had no business running. The pay back? Horrendous leg cramps and a terrible second half. 4. Be conservative in the first half. In all of the marathons that I have felt successful I didn’t burn it all out in the first half and then was able to reach for negative splits during the second half. 5. Listen to your body. Use your breathing, the sound of your footsteps and your own energy to establish a rhythm. By tuning into yourself you will get into that zone! Good luck to everyone who has a race coming up!. My spirit is with you on the course! What are your best marathon tips? Run your own race was a tip my trainer gave to me many years ago and has really stuck with me. I use it all the time but don’t always perform it in reality. These are some great tips! Number 1 is always so hard especially during tapering. #3 totally resonates with me. BTDT. Ugh. I finished the first half on pace for 3:40 marathon but my plan was for a 4 hr. one. Boy did that back half ever hurt! awesom awesome tips! Being conservative in the first half is my downfall. I always go out to fast. Good luck to everyone this weekend! These are all great tips! I had no idea you had done so many marathons! I am SO excited to turn 40 just for the extra cushion for Boston since qualifying is a big goal of mine, lol. I think I may go for the Steamtown Marathon in PA, it’s a downhill race and great for qualifying! Great tips! Number 4 is vital. If you trained for a four hour marathon and find yourself running 8 minute miles, believe me, this is not the day you’re going to take 30 minutes off your PR. Marathons don’t work that way. Debbie recently posted…Are You Ignoring These 7 Important Muscles in Your Workout? These are awesome tips! I haven’t run a marathon yet, but I am strongly debating one next year…. Every marathon teaches me something new. I think it’s important to have more than one finishing goal, because the ultimate goal should be to have fun. Training takes over most of your life for at least 12-18 weeks–you’d hate to throw that away on one race, right? All great tips, not just for running a marathon but really any long distance race for this matter. I applaud all of you that run marathons, a half enough for me :). These are great running tips! I tell everyone who is running a marathon that no matter what, make sure to have fun! All that hard work comes down to one day, and you don’t want to walk away disappointed.